Visiting Morocco and Need Help Planning? I regularly get emails from readers who are looking for help planning their trips to Morocco. While I wish that I had the time to help everyone, it’s simply not possible. I have put together a few options for travelers needing more help. 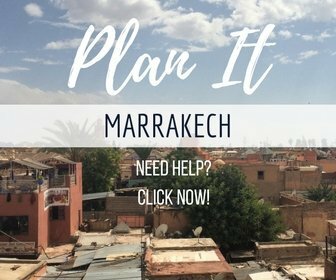 I have taken all of my best advice and information to help you plan your time in Marrakech (and will hopefully expand this to the rest of the country) and put it into an online interactive course/trip planning resource. This course is only $49 and you have lifetime access. I continually update this site with more information whenever it becomes needed. Join the MarocMama Trip Planning Community! I often see two types of tourists visiting Morocco; those who prefer to have a vacation planned start to finish for them, and then there are people who want to plan their own trip but need a little assistance. We can help you with both! Whether you’re the first type of traveler, looking for a reputable agency to help you from start to finish or you’re the second, someone who just needs some help, we can work together. I am partnering with Kathi of Roaming Camels, here in Marrakech, to offer travel planning services. There are multiple levels of help, depending on how complex or in depth your questions are. Plan A – You’re coming to Morocco and have a few quick questions that need to be answered. We’re happy to suggest some ideas to answer your questions. If your questions are beyond the scope of a quick reply, we’ll let you know which service upgrade we would suggest. For trips to Morocco that are less than five days this is the plan for you. This option allows you to ask the questions you may have and get help planning your itinerary. If you’d rather not handle the booking and reservations (riads, hotels, drivers etc), you can request a quote for handling the complete planning of your trip; including bookings. This service starts at $200, the cost of your travel reservations is in addition to this if you choose to have us do this for you. For a long term trip to Morocco you may need more help planning and coordinating where to go and where to stay. If you are in need of this type of assistance there are different price levels depending on your specific needs. Please get in touch with us to discuss your specific needs, we can then provide you a quote. We recognize no two travel plans are alike. If you have special circumstances or situations, this is the plan you’ll likely fall under. When you get in touch, we’ll be able to let you know how we can help and provide you a price quote. When your plan is complete you’ll be supplied with the detailed itinerary based off the information discussed. Trip coaching is done via email. You’ll have a paper trail and plenty to go back to. It is also possible to organize a phone call if this is something that would be helpful. Send an email introducing yourself. We will then respond with an invoice for payment and the next steps. Your interests and/or goals for this trip. Describe your favorite vacation in the past and the worst vacation so that I can get a feel for what you really like and what you dislike. I am very happy to have found a partner to assist with helping as many travelers as possible along this journey to Morocco! Kathi will be facilitating emails and we will both be weighing in on advice for travelers.